EA 19. Tushratta to Pharaoh, mid-1300's BC. Lines, obverse, 1-41 (of 85). 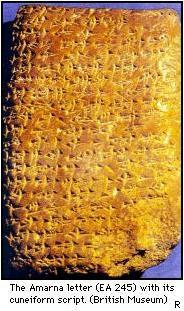 Amarna letter EA 19, is a tall clay tablet letter of 13 paragraphs, in relatively pristine condition, with some minor flaws on the clay, but a complete enough story, that some included words can complete the story of the letter. Entitled "Love and Gold", the letter is about gold from Egypt (gold mine production), love between father-king ancestors and the current relationship between the King of Mitanni and the Pharaoh of Misri (Egypt), and marriage of women from King Tushratta of Mitanni to the Pharaoh of Egypt. 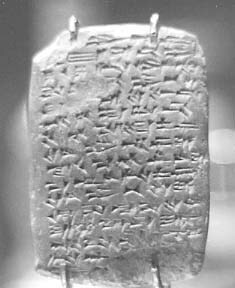 The Amarna letters, about 300, numbered up to EA 382, are a mid 14th century BC, about 1350 BC and 20 years later, correspondence. The initial corpus of letters were found at Akhenaten's city Akhetaten, in the floor of the Bureau of Correspondence of Pharaoh; others were later found, adding to the body of letters. (Para I, 1-8)–Say to Nimmureya, Great King, the king of Egypt (Misri), [my] brother, my son-in-law, who loves me, and whom I lov[e]: Message of Tushratta, Great King, [your] father-in-law, who loves you, the king of Mitanni, your brother. For me all goes well. For you may all go well. For your household, for my sister, for the rest of your wives, for your sons, for your chariots, for your horses, for your warriors, for your country, and for whatever else belongs to you, may all go "very, very well"-("dan-is, dan-is"). (Para II, 9-16)–As far back as the time of your ancestors, they always showed love to my ancestors. You yourself went even further and showed very great love to my father. Now, in keeping with our constant and mutual love, you have made it ten times-(Akkadian: a-na 10 šu—"for ten times") greater than the love shown my father. May the gods grant it, and may Tessup, my lord, and Aman and Tessup, my lord, and Aman make flour[ish] for evermore, just as it is now, this mutual love of ours. (Para III, 17-24)–When my brother sent Mane, his messenger, saying, ("um-ma")-"Send your daughter here to be my wife and the mistress of Egypt," I caused my brother no distress and immediately I said, ("um-ma")-"Of course!" The one whom my brother requested I showed to Mane, and he saw her. When he saw her, he praised her greatly. I will l[ea]d her in safety to my brother's country. May Shaushka and Aman make her the image of my brother's desire. (Para IV, 25-29)–Keliya, my messenger, brou[ght] my brother's words to me, and when I heard (them), they were very pleasing, and I rejoiced very, very much, saying, ("um-ma")-"'Certainly' there is this between us: we love each other.-(?!)" Now, with such words let us love (each other) forevermore. (Para V, 30-33)–When I wrote to my brother, I said, ("um-ma")-"Let us love (each other) very, very much, and between us let there be friendship." I also said to my brother, ("um-ma")-"May my brother treat me ten times better than he did my father." (Para VI, 34-38)–I also asked my brother for much gold-(KU3-SIG17.MEŠ), saying: ("um-ma")-"May my brother grant me more than he did by father and send it to me. You sent my father much gold. You sent him large gold jars and gold jugs. You se[nt him] gold bricks as if they 'were (just) the equivalent of' copper." In letter EA 19, 'gold' is referenced 21 times. It is used in connection with other gift names in the closing paragraph, P. XIII, as examples: 1 gold goblet, and 19 pieces of gold, its centerpiece being of genuine lapis lazuli set in gold. The entire list contains ten items, ending with: 10 teams of horses; 10 wooden chariots along with everything belonging to them; and 30 women (and) men. 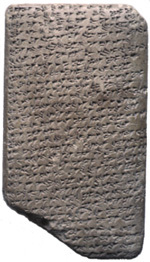 The first mention of 'gold', Akkadian language "hurāṣu" occurs on the obverse, EA 9 (photo above), in paragraphs VI and VII. Unlike EA 9 (from Burna-Buriash II of Babylon) which just uses the sumerogram KUG.GI for gold (sumerogram KUG.GI = hurāṣu), EA 19 uses the plural form in some of the cuneiform signs. For lines 34, 37, Para VI, and line 41, Para VII the form is KUG.GI.MEŠ. Of note KUG is used infrequently in the Amarna letters (Buccellati, 1979). GI, or gi is used more commonly (probably mostly as a syllabic) in the Amarna letters (Buccellati, 143 times) An example of its Amarna letter usage is a letter from Jerusalem, stating intrigues of people and surrounding cities. 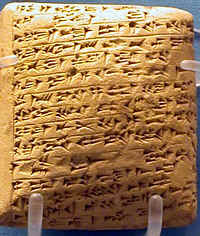 It is used in Jerusalem letter Amarna letter EA 289, titled A Reckoning Demanded, for the name of Tagi (Ginti mayor), as Tagi, (Ta-gi, first usage tablet obverse, line 11). Wikimedia Commons has media related to Amarna letter EA 19, Tushratta to Pharaoh, "Love and Gold". ^ Moran, 1987, 1992. 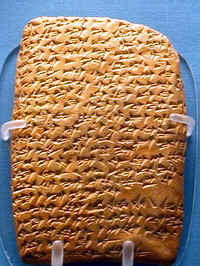 The Amarna Letters, pp. 43-46. EA 19: Love and gold. ^ Moran 1987, 1992, EA 19, Love and Gold, pp. 43-46, p. 45. ^ Parpola, 197l. 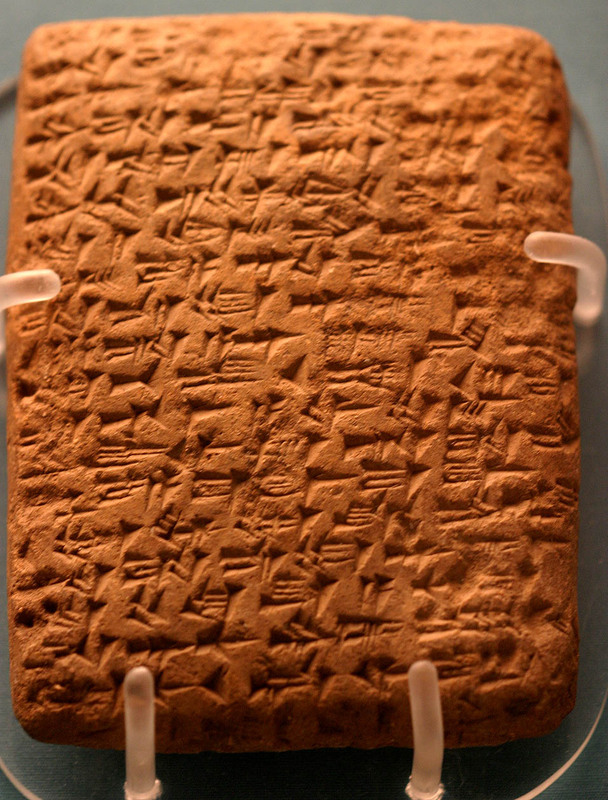 The Standard Babylonian Epic of Gilgamesh, Glossary, pp. 119-145, hurāṣu, p. 126. ^ Buccellati, 1979, Comparative Graphemic Analysis of Old Babylonian and Western Akkadian, in UF11, (Ugarit Forschungen (Neukirchen-Vluyn), 1979). Buccellati, Giorgio. Comparative Graphemic Analysis of Old Babylonian and Western Akkadian, from Ugarit-Forschungen 8, (Neukirchen-Vluyen). Parpola, 197l. 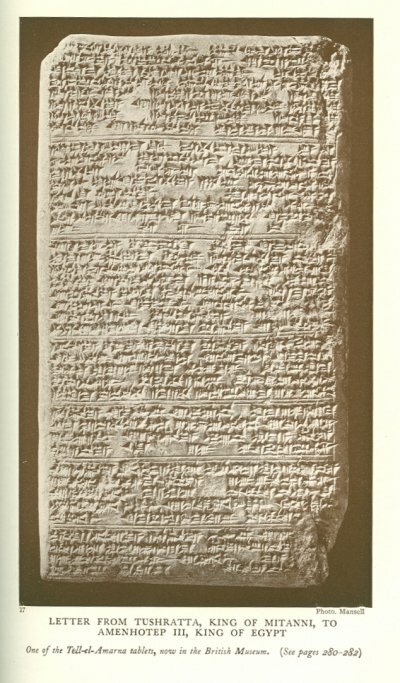 The Standard Babylonian Epic of Gilgamesh, Parpola, Simo, Neo-Assyrian Text Corpus Project, c 1997, Tablet I thru Tablet XII, Index of Names, Sign List, and Glossary-(pp. 119–145), 165 pages. Ugarit Forschungen (Neukirchen-Vluyn). UF-11 (1979) honors Claude Schaeffer, with about 100 articles in 900 pages. pp 95, ff, "Comparative Graphemic Analysis of Old Babylonian and Western Akkadian", ( i.e. Ugarit and Amarna (letters), three others, Mari, OB,Royal, OB,non-Royal letters). See above, in text.